For lovers of Radha-Krishna Vrndavana lila and sadhakas doing yogapitha dhyana, we herein present Sri Krishna Dasa Kaviraja’s portrayal of Priya-Priyatam’s Vrndavana Yogapitha in Govinda Lilamrta. 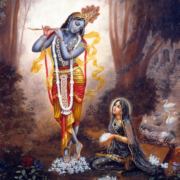 Before Their nightly rasa dance (ratri/nisa lila (10:48 p.m.-3.36 a.m.), Sri Sri Radha-Govindadeva meet Their beloved sakhis in a jeweled temple called the Yogapitha Mandir in Vrndavana. The entire area of Yogapitha appears like an island in Yamunaji. The island is formed by Yamunaji who rushes in from the north, divides into two branches flowing by the island’s east and west sides, and again unites in the south to form one gorgeous blue river. It appears like Yamunaji is holding Yogapitha on her lap with the arms of her beautiful waves. From Yamunaji’s banks the island rises gradually to a small hillock shaped like a sea turtles’s back. More than fifty types of exotic trees embraced by fragrant flowering vines adorn the island. To facilitate learning lila and meditation, we present the individual features of Vrndavana’s Maha Yogapitha. Govinda-sthali is the main name of Yogapitha which amazingly can change its colors according to time and the moods of Radha and Krishna. For various confidential reasons, the gopis call it Keli Mandir. When Sundari and the sakhis see Yogapitha, they succumb to sumptuous thoughts of Syama. The Vedas call it Gopala’s Simhasana Yogapitha. The Urdhvamnaya Tantra mentions many deeply descriptive names i.e. Ananda Mandap, Candravali Duradarsa, Kandarpa Mandapa, Keli Mandir, Maha-madhurya Mandapa, Radha Saubhagya Mandir, Ratna Mandap, Sathrajya Mandap, Saubhagya Mandapa and Srngara Mandap. From a drone view the entire golden-soiled area of Govinda-sthali, which stands on top of the hillock, looks like a huge lotus flower with thousands of petals. Each petal is actually a separate seva kunja of a specific sakhi for serving Syamasundara! Trees: The trees include amaranth, asoka, asvattha (peepul), bakula, banana, banyan, betel, bilva, campaka, date and coconut palms, guvaka, jackfruit, jambu, kadamba, lodhra, mango, naga-kesara, parijata, plaksa, punnaga, tamala, and sandalwood. Water basins of different shapes and heights made of rare gems i.e. blue sapphires crystal, diamond, emerald, moonstone, and ruby surround each tree. Desire Trees: The unlimited kalpa latas and vrksas (desire-fulfilling vines & trees) supply anything at any time. Fulfilling all Krishna’s seva needs, they regularly give lots of tasty fruits, fragrant powders, clothes, ornaments, scents and gems! The flower laden vines automatically form garlands for Krishna’s use. To satisfy Radha-Govinda, colorful jeweled swings decorated with fancy fabrics and flowers hang from the many desire trees. Birds: Vraja’s birds attract and excite everyone with their skittish movements and jovial sweet singing. There are bharadvajas, cakoras, cakravakas, cranes, cuckoos, doves, haritas, mynas, parrots, peacocks, pigeons, roosters, sparrows, swans etc. Animals: Assorted animals, including black stags and twelve species of deer i.e. Renku, Camaru, and Rohita frolic in the forests and nibble on the fresh grass in Vrndavana. Kunjas: To excite loving hearts, the walls of Krishna’s jeweled keli kunjas have gem pictures of mating birds, animals and celestials. Colorful canopies hang over the beds of fragrant flower petals adorned with comfortable pillows. Next to the beds are small tables with canisters of kajjala and kunkuma, crystal glasses, flower fans, jugs of honey nectar, mirrors of jewels, pan boxes, and perfumes. Aho! The kunjas look like jeweled temples, but the walls are merely flowering creepers and the roofs are just dense tree foliage. Grounds—The central ground of Govinda-sthali is golden with jeweled designed borders surrounded by thousands of kalpa vrksa kunjas. Yogapitha Mandir—in the center of everything is the jeweled Yogapitha Mandir. The mandir is surrounded by a raised veranda with jeweled steps on four sides. Parijata, Mandara, Haricandana and Santanaka desire trees decorate its four corners. From the four directions around the Yogapitha Mandir, there are four jeweled pathways down the hill to Yamunaji. Evenly spaced, super fragrant bakula trees line the paths. Colorful well-designed flower beds lie between the trees. At the end of each pathway are four beautiful jeweled bathing ghatas jutting into Yamunaji. Radha-Govinda Yugala Vrindavana Yogapitha ki jai! Jai Jai Sri Radhe! Jai Sri Krishna!